Lung cancer is the leading cause of cancer-related deaths worldwide, and small cell lung cancer (SCLC) is particularly aggressive and quick to metastasize. Currently, routine therapy for SCLC is treatment with the chemotherapy drug cisplatin. While cisplatin is effective early in treatment, the cancer cells eventually become resistant to the drug. New research from the laboratory of George Stark, PhD, Lerner Research Institute Department of Cancer Biology, suggests that combining cisplatin with a new experimental drug called CBL0137 is highly effective in treating SCLC and may work by affecting three different pro-cancer pathways. CBL0137—which was discovered at Cleveland Clinic in the laboratory of Andrei Gudkov, PhD, DSci, former chair of Lerner Research Institute's Department of Molecular Biology (now renamed)—has been shown to have positive effects in several types of cancer. 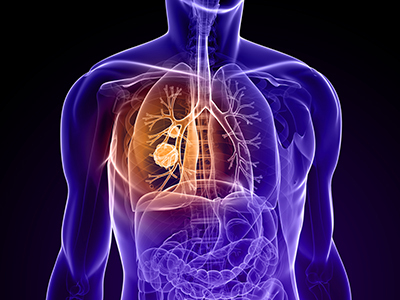 To investigate the drug's potential efficacy in SCLC, the researchers treated four SCLC cell lines—three patient-derived and one derived from a preclinical disease model—with either cisplatin, CBL0137 or a combination of both drugs. The cells treated with the combination therapy had greatly reduced cancer cell survival and tumor growth compared to the cells treated with either drug alone, suggesting that CBL0137 helps prevent and overcome cisplatin resistance. Further analysis revealed that CBL0137's potency in SCLC is multi-dimensional. The study findings suggest that CBL0137 attacks a combination of three different cellular pathways that contribute to lethal chemotherapy resistance. Cisplatin damages sections of DNA that encode various pro-cancer pathways, leading to cancer cell death or cycle arrest. SCLC cells eventually learn to self-repair these damaged sections of genetic code, enabling them to evade the drug's effect in the future. A protein analysis showed that CBL0137 inhibits the activity of the histone chaperone protein called FACT (facilitates chromatin transcription), which plays an important role in this DNA repair process. This is one way CBL0137 may help prevent resistance. FACT also contributes to cancer by regulating the expression and function of several stem cell transcription factors (SOX2, Nanog, Oct4), which enable the cells to self-renew. A subset of SCLC cells called tumor-initiating cells (TICs) abundantly express these proteins, can self-renew and, therefore, are believed to contribute to cisplatin resistance. In both TICs and non-TICs, CBL0137 treatment reduced expression of these dangerous proteins and cancer cell survival, but a significantly greater effect was observed in TICs. This suggests that CBL0137 preferentially targets the pro-cancer FACT pathway in TICs. Since SCLC tumors have higher levels of TICs than non-TICs, this is another way CBL0137 may work to fight cisplatin resistance. Taken together, these findings offer great hope that supplementing chemotherapy treatment with CBL0137 may prevent cisplatin resistance and effectively treat SCLC. This study identifies three different ways that CBL0137 may confer these benefits. Understanding the cellular mechanisms at play will be very important for future studies, which are already moving forward. Dr. Stark's laboratory has received a grant from the Department of Defense to continue this work in other cell culture and preclinical models. This first phase of study was funded by VeloSano, Cleveland Clinic's flagship campaign to raise money for cancer research. In four years, the initiative has raised more than $12 million. This project is but one example of these dollars hard at work in the fight against cancer. It also demonstrates Lerner Research Institute's commitment to conducting leading-edge research that quickly and meaningfully impacts the lives of patients, developing new standard-of-care therapies that change the way care is delivered. Sarmishtha De, PhD, is first author on the study, which was published in the Journal of Cancer Research. Dr. Stark is a Distinguished Professor of the Lerner Research Institute and former institute chair. He is a pioneer in the field of cancer biology and a member of the National Academy of Sciences and fellow of the Royal Society of London.